I'm always focused on my dreams..."
on. I've colored this one with colored pencils. Can't wait to see the final painting, it will look fabulous! This is so wonderful. Love the colours and those biiiig eyes. This is so sweet! It has a wonderful soft focus that suits it. Ohhh,Dear Afi... He´s like a baby....so cute!Even though it's just a sketch! Thanks for visiting my blog and leaving such inspiring comments! :) Kisses, light and love! SUERTE! What a sweet little birdie! I really like that sketch version, the contrast between the cuteness of the little bird and the roughness of the dark pencil. Kawaii!! this is the first time i've ever visited your blog, and wow, you are really talented!! and did i read that you're in toronto? i lived there for a while, and will probably head back there this summer. see you in blogland! Very sweet. I love the colored pencils! Very sweet bird! I agree, the soft focus and colors really suit the sketch well. Nice work! Your little bird is so simple yet looks so sweet! This is gorgeous! 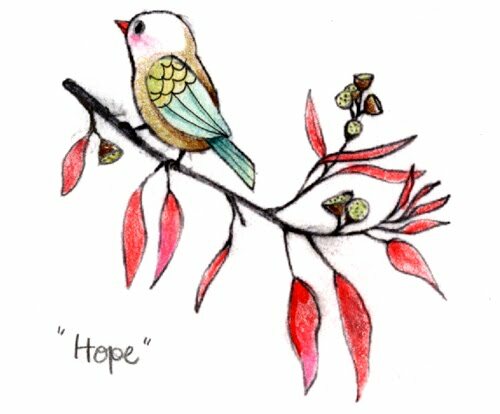 "Hope" ~ a word that really touch my heart! I am looking forward to peek at this beautiful painting when it's done. Have a lovely merry happy day and love to you!